Birdwatching is a favorite pastime for many. In fact, you might find yourself enjoying your chirping friends so much, that what started as one birdhouse in your yard might quickly multiply into half a dozen birdhouses. Unfortunately, pre-made birdhouses can get expensive. These DIY birdhouses are fun to make, and they'll save you a few dollars, which you can opt to spend on some birdseed for a bird feeder or two. For beginner woodworkers, a birdhouse might be one of the first things they learn how to make. Constructing a basic wooden birdhouse is a relatively simple process once you know how to do it. Likewise, this particular house is so easy to make, that you're encouraged to have your kids help you along with the project. By combining an old teapot with a drawer, this blogger created a whimsical birdhouse ready for some nesting. First, she hung the pot from twine using the drawer handle holes. Next, she glued the thrifted teapot to the back of the drawer. Finally, she glued the top of the teapot to the bottom of the drawer to act as a landing perch. These birdhouse plans are for architecture enthusiasts that also love to have birds nesting on their property. They are also ideal for the non-woodworking DIYers out there because you only need a few key tools to complete the project. In the end, you'll have a mid-century modern birdhouse that's sure to be a conversation piece in your yard. If you love crafting but aren't into woodworking projects, there are plenty of creative ways to make a birdhouse more custom. Pick up a pre-made birdhouse from the craft store or build one using a simple kit. Then, paint it your favorite home color. Next, gather a bunch of pennies and glue them on as the roof. Make sure you use the right type of adhesive so the roof won't fall off. Making this old colonial style birdhouse is easier than you might imagine. The key to nailing this look is to keep the white paint looking very weathered and adding character with cedar shake shingles for the roof. This birdhouse requires no nails! In fact, you don't even need glue! Instead, this birdhouse uses Scotch Extreme Mounting Tape and Fasteners to keep everything together, which cuts the time to build this in half. To add a more rustic feel to the project, try to find some old beat up hardware for the perch. If you live in an apartment and have no option to put up a birdhouse on your property, this is a great project to tackle. Birdhouses look great as home decor on bookshelves, in nurseries or wherever your heart desires. If you wanted to use this birdhouse outdoors, just be sure to seal the paper using a clear acrylic sealer. These birdhouses may require a bit more time and patience than some of the other birdhouse plans on this list, but the pay off is worth it. If you want to put multiple houses on a single fence, it's wise to use the same materials for each birdhouse but mix up the design a bit. If you want to make a birdhouse for little to no cost, this is the tutorial for you. Apparently, these simple wooden birdhouses cost around $2 to make. The only part this birdhouse plan is missing is how to adhere the birdhouse to a tree or pedestal, which will cost you a little more. If you want to tackle an unusual birdhouse option, this is the project for you. However, is this birdhouse functional? Since this doubles as a bird feeder, there is a chance that birds will gather there to eat, but don't be surprised if they opt not to put a nest so close to the ground. 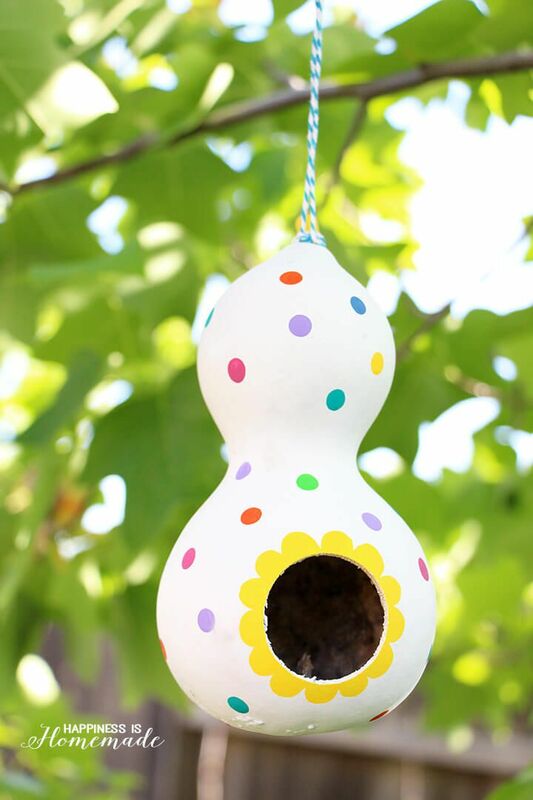 Gardeners that plant gourds will appreciate this birdhouse DIY. Simply dry out a gourd by leaving it outside for several months. By the time Spring comes, the gourd will be ready to be cleaned and emptied, since all of its contents should be dried out. Make a hole large enough for a bird near the bottom of the gourd, then hang from a tree using heavy duty string or twine. This birdhouse DIY is pretty involved, but it's also really fun to make. The tutorial will show you how to adhere to different kinds of stones to your birdhouse without them falling off and will also show you a few different designs you can attempt to recreate. If your yard lacks trees, these birdhouse plans will help. The tutorial shows you how to quickly make a pedestal for a pre-made birdhouse, but the pedestal could work on most of the birdhouse designs featured in this roundup. Live roofs or green roofs are really popular for birdhouses and are relatively simple to create. To convert an existing birdhouse, add trim around the roof line to create a cavity. From there, plant greenery that has shallow root systems. This charming DIY birdhouse has farmhouse style written all over it. To make this birdhouse more rustic, an old shutter was used to create the exterior walls, and a vintage glass knob was added as a perch.